A team of scientists from Purdue University say they may have discovered a new method to predict solar flares more than a day before they occur. This would not only provide advance warning to help protect satellites and power grids, but also save the lives of astronauts from potentially dangerous radiation. The team made the breakthrough by measuring differences in gamma radiation emitted when atoms in radioactive elements “decay,” or lose energy. The new solar flare detection system would work by detecting radioactive decay rates, which are influenced by solar activity. According to the team’s hypothesis, these solar influences can alter due to seasonal changes in the Earth’s distance from the sun and also during solar flares. 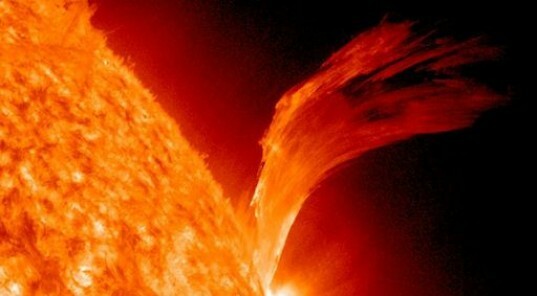 The team consisting of Ephraim Fischbach, a Purdue University professor of physics and Jere Jenkins, a nuclear engineer and director of radiation laboratories in the School of Nuclear Engineering discovered that the decay rate of a radioactive sample changed slightly beginning 39 hours before a large solar flare. It is this discovery that forms the basis of their detection system. “It’s the first time the same isotope has been used in two different experiments at two different labs, and it showed basically the same effect,” Fischbach said. He added that the findings agree with data previously collected at the Brookhaven National Laboratory. “When the Earth is farther away, we have fewer solar neutrinos and the decay rate is a little slower,” Jenkins said. “When we are closer, there are more neutrinos, and the decay a little faster.” Neutrinos have the least mass of any known subatomic particle, yet it is plausible that they are somehow affecting the decay rate, he added. “What this is telling us is that the sun does influence radioactive decay,” Fischbach said. During solar storms, large flares produce a “coronal mass ejection” of highly energetic particles, which can interact with the Earth’s magnetosphere, triggering geomagnetic storms that sometimes knock out power. It is expected that over the next year, the planet will be hit by such storms as part of an 11-year cycle. The Purdue experimental setup consists of a radioactive source – manganese 54 – and a gamma-radiation detector. As the manganese 54 decays, it turns into chromium 54, emitting a gamma ray, which is recorded by the detector to measure the decay rate. Purdue has filed a U.S. patent application for the concept. The team’s findings were published online last week in the journal Astroparticle Physics. A team of scientists from Purdue University say they may have discovered a new method to predict solar flares more than a day before they occur. This would not only provide advance warning to help protect satellites and power grids, but also save the lives of astronauts from potentially dangerous radiation. The team made the breakthrough by measuring differences in gamma radiation emitted when atoms in radioactive elements "decay," or lose energy.